We are late getting our garden into the ground, despite having had a warmer than average spring. Actually, it’s because we had a warmer than average spring, and more importantly an exceptionally mild winter, with no hard frost. The problem is slugs. Well, they’re one of the problems anyway. 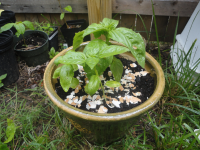 The first puzzling thing that happened was that a lot of the seeds we planted in little pots in early April never sprouted. And they weren’t finicky or unfamiliar plants. 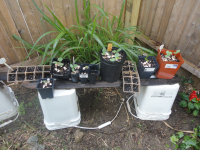 They were old standbys for us—cucumbers, watermelon, sunflowers, and zinnias, plus some experiments like Echinacea and other flowers. We replanted cukes and watermelon, and then practically overnight, slugs decimated the basil and the broccoli and most of the flowers, basically all the seedlings that were doing well. The pots had all been off the ground for weeks, but I’d moved them in the garden plot to keep them out of the way of the landscaping crew that was doing a spring cleanup in the yard and the slugs found them and went to town. Shortly afterward the cucumbers and watermelons sprouted (both the first set we planted and the second planting) and the slugs got a whole tray of cucumbers even though they were off the ground. We filled all the seedling pots with broken eggshells and the slug damage abated considerably, though one evening I did find three of them snacking on the cilantro which had leaves hanging over the edge of the pot, allowing access without crossing the eggshell fortifications in the soil below. Our normal gardening philosophy is low-maintenance. We plant what we know works for us, add a few experiments every year and give up pretty easily on those crops that don’t work. Spinach doesn’t thrive in our soil, for example, and rather than try to change the soil, we changed crops and found that lettuce grows fine. Also, we’re not planting corn this year because the squirrels always eat it the instant it’s ripe (or sometimes earlier). Clearly this is not going to be a normal year, however. I knew this when I saw the whiteflies on the tomatoes. I would not have even known what they were if not for the gardening guides I’ve been editing, but I recognized them from the photograph and then I remembered there was something like that on the broccoli last year. I went to the Internet to learn more and the first thing I found was that all the queries people posted about them seemed to be about tomatoes, basil or marijuana. Fortunately, we’re not growing marijuana or we’d have hit the trifecta. In small numbers whiteflies are harmless but they carry plant viruses and the holes they leave in the plant make it vulnerable to blight and other diseases. As it’s also supposed to be a bad year for fungal diseases like blight, it seemed like a good idea to be proactive. Whitefly larvae are so tiny they’re just little white lines on the leaves, with no visible features like face or legs. This made it easier to spend an hour with Noah on Saturday sitting in the garden, picking them off our four tomato plants and drowning them in little cups of water. (The tomatoes are the only crop we have in the ground.) Noah was a real trouper. I told him he could quit after twenty minutes but he kept right at it. And he doesn’t even like tomatoes! I removed some of the most compromised leaves from the plants and let Noah spray the plants with the hose to knock off some of the ones we’d missed and then the next day, I applied a horticultural oil to smother the rest. The same day I noticed the whiteflies, I also found evidence of leaf miners on an ornamental plant but we decided to let them have it. It’s far from the main garden and you’ve got to pick your battles. Despite all our gardening woes, we still had more cucumber and watermelon seedlings that we could reasonably plant, so we took eight watermelon sprouts and four cucumber sprouts to June’s old preschool to donate to the plant sale that was going on during the annual garden party. I heard they all sold, which made me happy. (While we were there we bought some basil plants Riana’s family had grown.) Our remaining seedlings Beth transplanted into bigger pots rather than putting them in the ground, which is what we’d normally do when they get to this size. We want to let them get bigger and stronger before we put them in the slug-infested ground. When we do, we’ll put down eggshells and coffee grounds and beer and everything else we’ve heard helps. I decided to replant sunflowers and zinnia seeds, too, because I’m fond of them and they bring pollinators to the garden. Today Beth and I spent a good bit of the afternoon in the garden, removing the newspaper and mulch from what’s going to be the watermelon and pumpkin patch (pumpkins are our experimental crop this year), digging up the weeds that struggled through the winter covering, and weeding along the outside of the plot so we can put down newspaper to keep weeds from encroaching from the sides. It was a pleasant day to work, around eighty degrees with little humidity. The garden smelled of newly turned earth and the honeysuckle that tumbles over the back fence this time of year. 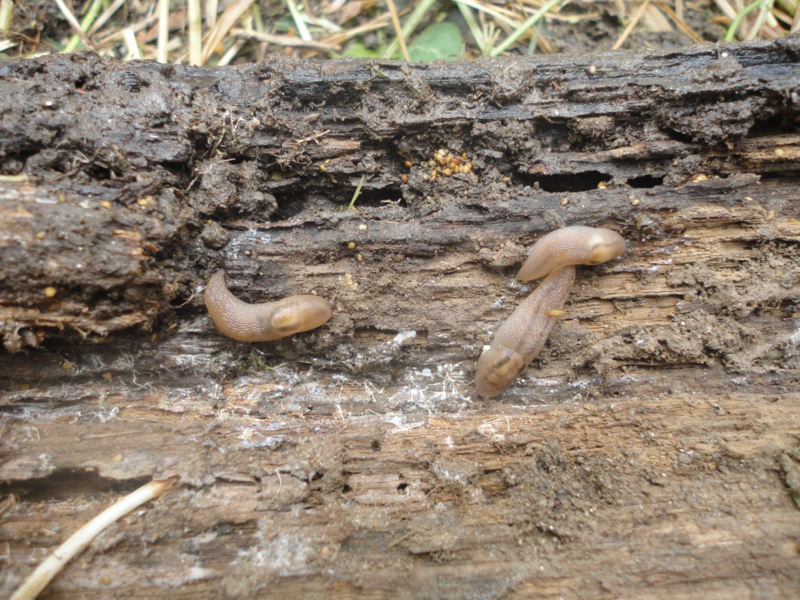 I didn’t see very many slugs as I was digging in the ground, which surprised me. Then it occurred to me to lift up the logs and old fence posts we use to mark the plot borders and there they were. It was like a slug convention. There were dozens all nestled in a heap under one log. Up to then I’d been tossing the stray slugs I found over the fence and onto the weeds at the edge of the driveway, figuring it would be hard to return to the garden from there. After slaughtering numberless whitefly larvae the day before, I wanted to give them a sporting chance at survival somewhere far away from my watermelons and pumpkins. 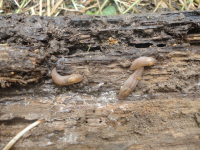 But under the log I found more slugs than I could reasonably relocate, so I plucked them up one by one and dropped them into a beach pail and let Beth take care of them. She said something about salt. I felt a little sick about it and I was relieved when a bumblebee tumbled into a bucket of water and I got to rescue it. I’d been killing things all weekend and it didn’t sit well. We’ll be away next weekend so it might be two weeks before we plant the seedlings and sow lettuce and carrot seeds. I think whatever we get out of the garden this year will be more hard-won than usual, but it was still good to get ourselves back to the garden. This entry was posted in Gardening by Steph. Bookmark the permalink.